Wherefore, the things which are pleasing unto the world I do not write, but the things which are pleasing unto God and unto those who are not of the world. Wherefore, I shall give commandment unto my seed, that they shall not occupy these plates with things which are not of worth unto the children of men. Nephi began his record by praising his parents and noting that he had been “taught somewhat in all the learning of my father” (1 Nephi 1:1). 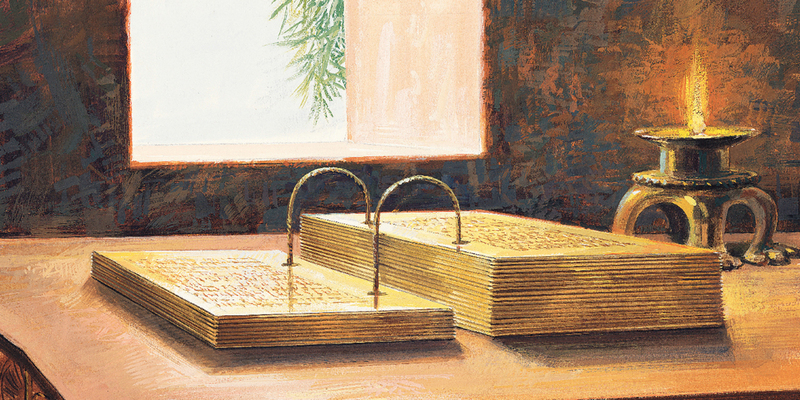 He further stated that his record was made “in the language of my father, which consists of the learning of the Jews and the language of the Egyptians … and I make it according to my knowledge” (1 Nephi 1:2–3). Biblical scholars recognize a genre of writing, found both in the standard, canonical scriptures (e.g., Job, Proverbs, Ecclesiastes, the Song of Solomon) and outside the canon, that they term “wisdom literature.” Among the characteristics of this type of writing, not surprisingly, is frequent use of the term wisdom. There is … a strong emphasis on the teachings of parents, and especially on instruction by fathers. Nephi frequently made comments that demonstrated his dedication to obtaining, preserving, and passing on wisdom or knowledge. And we had obtained the records which the Lord had commanded us, and searched them and found that they were desirable; yea, even of great worth unto us, insomuch that we could preserve the commandments of the Lord unto our children. Wherefore, it was wisdom in the Lord that we should carry them with us, as we journeyed in the wilderness towards the land of promise. (1 Nephi 5:21–22). 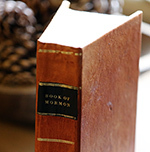 Dr. Halverson observed: “The fact that the Book of Mormon is with us today is, in part, a fulfillment of the Wisdom tradition to preserve the sayings of the wise,” citing 1 Nephi 6:5–6. Nephi’s reaction to his father’s dream of the Tree of Life is another example of how faithfully he lived the admonition to search for wisdom “as for hid treasures.” Unlike his brothers, who failed to seek God’s help to understand their father’s vision because they were convinced that “the Lord maketh no such thing known unto us,” Nephi decided to “ask [God] in faith, believing” that he would “receive” (1 Nephi 15:9, 11). LDS author Kevin Christensen, drawing on the work of biblical scholar Margaret Barker, noted that the biblical figures of Daniel and Joseph were prototypical wise men, in that they predict the future, interpret dreams, deal with heavenly beings, and are depicted in a royal setting, among other attributes. Nephi depicted himself similarly. Nephi accepted a kingly role (2 Nephi 5:18), interpreted dreams and predicts the future (1 Nephi 11–15), and spoke with angels (1 Nephi 3:29–30, etc.). “Adding to his stature as a quintessential man of wisdom,” Christensen noted, “Nephi demonstrates knowledge of writing (1 Nephi 1:2) and possesses appropriate wisdom in relation to mining and metalworking (1 Nephi 17:9–10), shipbuilding (1 Nephi 17:8–9; 18:1–8), navigation (1 Nephi 18:12–13, 22–23), and the arts of war (2 Nephi 5:14, 34),” all of which are seen as attributes of wise men in the Wisdom tradition. Nephi can be seen to be particularly concerned with obtaining wisdom, whether it be from sacred records or directly from God, the source of all wisdom. He worked hard to preserve it, as can be seen by his dedication to making and keeping his own sacred records. He also gives strict commands to those to whom he passes that responsibility. The Wisdom tradition emphasized the need for learning, for knowledge, for holding fast to the way of righteousness. The fact that Nephi so closely resembles the archetypal wise man and employs the Wisdom traditions of the ancient world supports the notion that the Book of Mormon should be read as an ancient text. As Taylor Halverson has noted, “If the Wisdom tradition is a foundation for Nephi’s scribal capabilities and outlook, perhaps the principles and literary skills represented by the scribal Wisdom tradition constitute the ‘learning of the Jews’ that Nephi references so early in his record.” Readers can better appreciate and comprehend Nephi as an author and as a person, and better internalize his message, by seeking to understand the ancient Wisdom traditions that can be found in both the Bible and the Book of Mormon. Furthermore, the value of possessing true wisdom should not be lost on the modern reader. They are aware that technology floods our world with easily accessible information. However, learning information is not the same as gaining wisdom and spiritual knowledge. Wisdom is arguably more valuable than information because wisdom provides guidance in applying that knowledge ethically and prudently. For example, young people today are inundated with information that could cause them to doubt the Church. However, no amount of scattered information can replace the power of wisdom in discerning between correct and false information. Only careful study with the heart and mind, and prayerful confirmation of the Spirit, can engender wisdom for discerning truth. Kevin Christensen, “The Temple, the Monarchy, and Wisdom: Lehi’s World and the Scholarship of Margaret Barker,” in Glimpses of Lehi’s Jerusalem, eds. John W. Welch, David Rolph Seely, and Jo Ann H. Seely (Provo, UT: FARMS, 2004), 449–522. Kevin Christensen, “Nephi, Wisdom, and the Deuteronomist Reform,” Insights 23, no. 2 (2003): 2–3. Daniel C. Peterson, “Nephi and His Asherah,” Journal of Book of Mormon Studies 9, no. 2 (2000): 16–25, 80–81. Taylor Halverson, “Reading 1 Nephi with Wisdom,” Interpreter: A Journal of Mormon Scripture 22 (2016): 284. Halverson, “Reading 1 Nephi,” 286. The description and interpretation of the Tree of Life in Lehi and Nephi’s visions have many parallels with the Wisdom tradition. For example, in Proverbs, Wisdom is personified as a female figure who worked with God from before the foundation of the world (Proverbs 8:22–34; compare 1 Nephi 11:12–21), and is also referred to explicitly as “a tree of life” that will make “happy … every one that retaineth her” (Proverbs 3:18; compare 1 Nephi 8:10). For more on this, see Peterson, “Nephi and His Asherah,” 16–25. Halverson, “Reading 1 Nephi,” 291. Halverson has further observed that “Nephi reflects the wider Wisdom literature tradition” as he demonstrates the following elements: 1. Listening to and recording the words of his wise father; 2. Valuing learning and education; 3. Embracing hard work; 4. Seeking understanding from the Lord despite suffering and trials; and 5. Demonstrating the difference between the wise man and the fool. Halverson, “Reading 1 Nephi,” 284. See Dr. Halverson’s article for more details on how Nephi’s writings demonstrate all of these elements. See Kevin Christensen, “Nephi, Wisdom, and the Deuteronomist Reform,” Insights 23, no. 2 (2003): 2–3. Halverson, “Reading 1 Nephi,” 293.